In different occasions, people have been heard complaining that they cannot differentiate between the Chinese and Japanese writings. At the same time, you’d find some Japanese thinking they will find it easy communicating with Chinese because their languages share some characters. As a matter of fact, it is a confusing case since some of the characters from both languages look alike. They are, however, not the same and do not refer to the same things since the languages are dissimilar too. To set the records straight, it would be wise to separate the two based on their characters. Setting them apart based on their families, the order of words in sentences, and sentence structure might also help in a much better way. But first things first; what are the main culprits that make the layman confuse between the Chinese and Japanese writings? To begin with, there exist major correlations that make these writings to be subjects of confusion. The standard Japanese orthography, for example, has thousands if not millions of different Han characters that were borrowed from China centuries ago. Also, many of the words in both writings are written similarly which adds to the conclusion that even the languages are alike. This would be like concluding that the English, Vietnamese, Turkish, and Yoruba languages are the same since they share the same Latin script. To break the neck and bring out the basic differences, this post breaks down each writing and assigns it the respective characteristics that make it unique. What is the Chinese Writing? The Chinese writing is basically a logographic writing system and one of the world’s oldest and greatest systems. It is non-alphabetic and applies specific characters to write each meaningful or nonmeaningful syllable. Believed to have developed in the early 2nd millennium BC, the Chinese writing was fundamental to the writing systems in the East. It has its earliest inscriptions that were inscribed on pieces of bones dating from the Shang dynasty that existed between the 18th and 12th centuries BC. The Japanese writing makes up the Japanese written language. It is simply a combination of syllables and elements or characters. Kana: – this is one of the two typical passages of the Japanese writing. Kanji: – this system refers to the Japanese-Chinese characters that the Japanese system borrowed from the Chinese one. The Kanji system is composed of two more systems that are used to write the Japanese language. The two are hiragana and katakana. In this case, we are referring to the Kanji system more since it’s the one referred to as Japanese-Chinese. It is a system believed to have sprouted in about the 8th century CE. The Chinese writing is believed to have its roots back in the 2nd millennium BC while the Japanese writing (in this case the Kanji one had no writing system. It simply borrowed and imported characters from China around the 8th century CE. The Kanji system was to be later used to write verbs roots, nouns, and adjectives since the development of the kana syllabaries. Also, the Chinese writing entirely relies on hanzi while the Japanese Kanji writing relies heavily on the use of Chinese characters. One of the major differences between the two writings lies on the varied pronunciations of words using the same characters. For example, Hanzi is a Chinese pronunciation of Kanji, which is the Japanese writing’s way of pronouncing the term 漢字. This is a term used in both languages though. Another example that gives the difference in pronunciation is how the two write the term 誠. In the Chinese writing, the term is pronounced as chéng while in Japanese, it can be pronounced as either makoto or sei. Notably, the Japanese writing has multiple possible pronunciations while Chinese has only one option. The two writings share no phonetic similarities. This is because the Chinese writing is tonal while the Japanese one uses a pitch accent. For example, Mandarin Chinese has about four tones in addition to a neutral one while Japanese has a pitch accent system, that is, with rising and falling intonations. The Chinese writing has around 420 sound combinations. The Japanese writing, on the other hand, has fewer sound combinations, about 110 of them. The Chinese writing uses ten vowels while the Japanese writing has only five. As for the consonants, the Chinese writing has a total of 25 while Japanese has 18. The basic structure of sentences in the two writings differs too. For instance, the word order for Chinese is always an SVO (subject – verb – object) while the Japanese writing follows an SOV order, that is, subject – object – verb. Sarah Brown. "Difference Between Chinese Writing and Japanese Writing." DifferenceBetween.net. 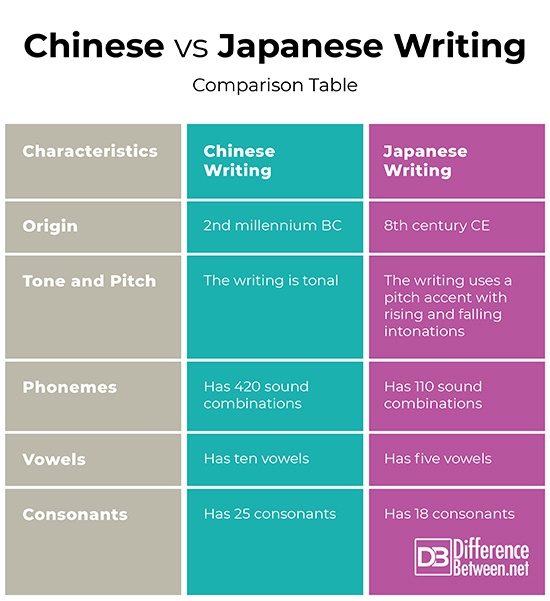 January 10, 2019 < http://www.differencebetween.net/miscellaneous/difference-between-chinese-writing-and-japanese-writing/ >. Fu, Edison. "Differences Between Chinese And Japanese In A (Not So) Nutshell. Round 2 — Are Japanese And Chinese Mutually Intelligible? - Rodmell House". Rodmell House, 2018, http://www.rodmellhouse.com/es/differences-between-chinese-and-japanese-in-a-not-so-nutshell-round-2-are-japanese-and-chinese-mutually-intelligible/. Accessed 5 Dec 2018. Fu, Edison. "Differences Between Chinese And Japanese, In A (Not So) Nutshell. Round 3 — Writing Systems. - Rodmell House". Rodmell House, 2018, http://www.rodmellhouse.com/es/differences-between-chinese-and-japanese-in-a-not-so-nutshell-round-3-writing/. Accessed 5 Dec 2018. Lab, Language, and Clyde Mandelin. "Legends Of Localization: How To Tell The Difference Between Chinese And Japanese Writing". Legends Of Localization, 2018, https://legendsoflocalization.com/is-that-written-in-chinese-or-japanese/. Accessed 5 Dec 2018.